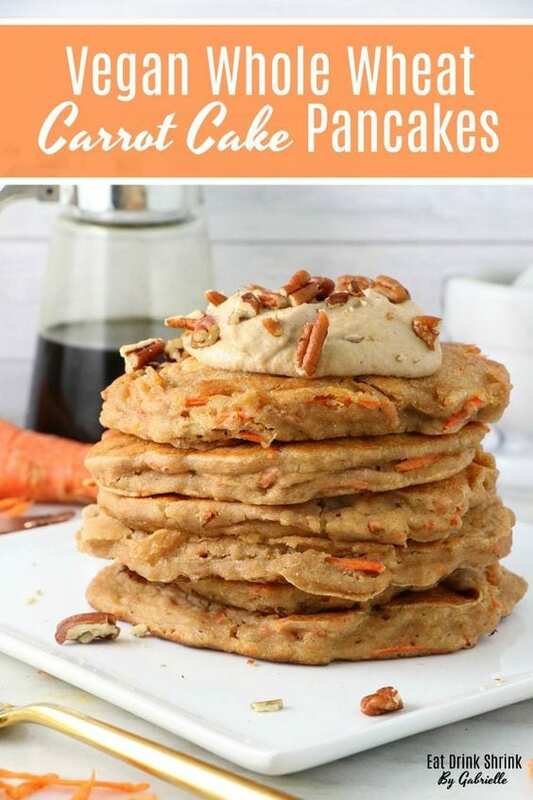 Vegan Carrot Cake Pancakes - Eat. Drink. Shrink. While putting this recipe together I realized I had this one drafted last year! Needless to say, it’s been on my foodie bucket list for a minute! Carrot cake is an Easter staple and I consider it similar to the pumpkin flavor profile we all know and love. So in keeping with the holiday tradition, these vegan whole wheat Carrot Cake Pancakes with cashew cream cheese were a no brainer. What I love about pancakes is that it’s the universal breakfast dish that is almost like a blank canvas. You can choose whatever base that you like, wheat flour, oats, pack it with whatever you like, and garnish with whatever topping you crave making the options endless! What I love about this recipe, is everything! It’s quick, easy, has minimal ingredients, affordable, packs tons of carrots, made with whole wheat flour, uses banana instead of egg, and the cashew cream cheese ties everything in together making it the perf Easter breakfast concept! If you’re looking for that healthy Easter inspired pancake, you have to try my recipe for vegan Carrot Cake Pancakes with cashew cream cheese! For the pancakes: Whisk together the flour, sugar, baking powder, pumpkin pie spices, baking soda and sea salt in a large bowl. Whisk together the banana, almond milk with vinegar, melted coconut oil, vanilla and orange zest in a large bowl. Add the carrots and mix until smooth. Add the wet ingredients to the dry ingredients. if using, and mix until just combined. To maximize the flavor, cover and refrigerate for at least 30 minutes and up to 3 hours. Heat a large nonstick skillet or griddle over medium heat. Coat the skillet with cooking spray or oil Spoon 1/4 cup mounds of the batter onto the skillet, spreading with a spatula. Cook until the tops are covered with bubbles and the edges look cooked, about 2 minutes. Carefully flip the pancakes over and cook until the bottoms are lightly browned, about 1 minute. Repeat with the remaining batter. Keep the cooked pancakes warm in the oven on a baking sheet, if desired. For the cashew cream cheese: Soak cashews in boiling hot water for 15 minutes or ideally overnight. Combine all of the ingredients in a blender or food processor. Blend until smooth. To serve: Stack the pancakes on a plate and drizzle with the maple cashew cream cheese, Sprinkle with chopped walnuts or pecans. If desired, you can toss chopped pecans in the pancakes! If you don't have pumpkin spice, simply use ginger, cinnamon, and nutmeg!